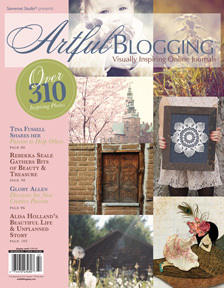 It was a happy day for me when I discovered that our library carries the delightful magazine Artful Blogging, Visually Inspiring Online Journals. It's hard to find it in this area. For these magazines are filled with gorgeous photography, stimulating postings from creative bloggers, not to mention a list of blogs that have been highlighted in the magazine. ...or maybe you just need to know you're not along and that bloggers everywhere--no matter how amazing we think they are--will sometimes have their own misgivings about the value of sharing online. "Share what matters to you." Not what you think someone else wants to see or hear. "Make it fun." If you're not having fun with it, what's the point? "No one is perfect." Even if her blog looks like she has a perfect life. Bloggers don't always share the hard times on-line, as many like to use their sites to focus on what is of a good report, beautiful and uplifting. I know I do -- I'm always on the lookout for that glimpse of 'heaven'. "Reconnect with life." That's a good one to remember. Sometimes we just need to step back from writing about life and spending more time living it. Reconnect back to your own heart and you'll dip into new inspiration to write about again. "Enjoy being you." Everyone does it differently, so do your blog your way. Without fear. With courage. And without any anxiety that it might not measure up to someone else's. It is not supposed to. It's your voice, your take on life, the way you see things and dream about them that we want. We want your blog -- we already have one of hers. I didn't even know there was a magazine for blogger! Now I'm on the hunt. You have always inspired me with your posts! Yes, there are posting blocks but your tips are helpful. I wasn't aware there were magazines for bloggers either; I will have to look to see if we have anything like this in the UK. I think Alice gives very good blogging tips. I've added a couple of photography memes to get me going with ideas and looking for new photography subjectss-it works! I dont thinkk I have seen this in England. It looks interesting. Good hints...thanks for sharing them! Thanks so much for sharing my tips here and mentioning me! Someone left a comment on my recent post and said you were how they found me...so thanks! I occasionally see this magazine at Chapters or Michaels, but it's rather pricey. If available at the library it will be at the downtown branch, where I rarely visit. 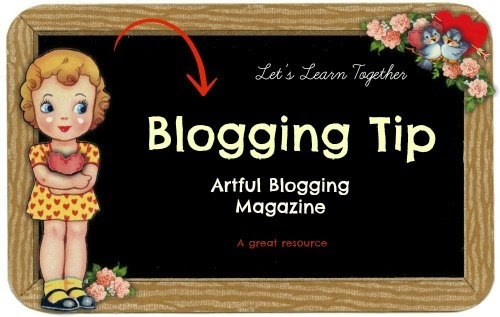 Great tips from Alice about blogging. It truly does inspire me too.